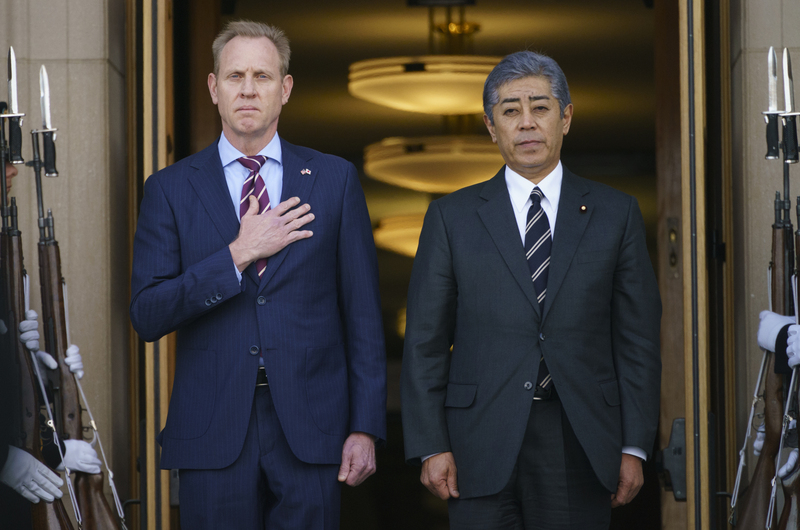 WASHINGTON - Defense Minister Takeshi Iwaya and acting U.S. Defense Secretary Patrick Shanahan agreed Wednesday to cooperate in new domains of warfare like outer space and cyberspace in a veiled response to China’s quest for military supremacy in such areas. Iwaya and Shanahan also affirmed full enforcement of U.N. sanctions on North Korea as a way of compelling it to abandon nuclear weapons and ballistic missiles, the Japanese minister told reporters after their meeting at the Pentagon. They agreed that deterrence by the two countries plus South Korea is “indispensable” for the security of the region despite ties between Tokyo and Seoul souring over an alleged radar lock-on incident involving a South Korean warship and a Japanese plane. It was the first meeting between the two ministers since Shanahan took the post on Jan. 1 following the resignation of Defense Secretary Jim Mattis. The talks came a month after Prime Minister Shinzo Abe’s Cabinet adopted a new 10-year defense policy and five-year midterm defense buildup program, both of which are intended to further strengthen the Japan-U.S. alliance. 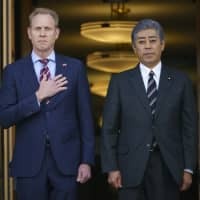 In the meeting, Shanahan “acknowledged the key role Japan’s new National Defense Program Guidelines and Mid-Term Defense Program will play in strengthening the alliance,” the Pentagon said in a statement. “The leaders reaffirmed the long-standing defense relationship as the cornerstone of regional security policy,” it said. Earlier Wednesday, Iwaya sought to establish close ties between the U.S. Space Command — which President Donald Trump has instructed the Pentagon to set up in response to the growing space capabilities of rivals such as Russia and China — and Japan’s envisaged space unit, an entity to be established by fiscal 2022 in line with the latest defense guidelines. In a speech in Washington, Iwaya also pushed for deeper coordination in the cyberspace domain with the U.S. Cyber Command, as he outlined a Japanese plan to set up a cyberdefense unit under the command of the defense minister by fiscal 2023. “For space, we will monitor situations in space all the time and develop capabilities to disrupt an opponent’s command-and-control and information communications,” he said, referring to the proposed unit. The envisaged cyber unit “will drastically enhance cyberdefense capabilities, including those to disrupt an opponent’s use of cyberspace in an armed attack against Japan,” Iwaya told the Center for Strategic and International Studies, a Washington think tank. Citing threats posed by North Korea, Iwaya urged firmer operational cooperation with the U.S. military and said the planned introduction of the land-based Aegis Ashore missile system in Japan will lead to a “tremendous increase” in its ballistic missile defense capability. In the Pentagon meeting, Iwaya and Shanahan underscored their opposition to attempts to alter the status quo in the East and South China seas, and pledged to cooperate in promoting the rule of law and the freedom of navigation there. The move was an apparent criticism of China’s militarization of outposts in disputed areas of the South China Sea and Beijing’s attempts to undermine Tokyo’s administration of the Senkaku Islands in the East China Sea. Iwaya and Shanahan affirmed close coordination in providing capacity-building assistance in maritime security to developing countries as part of efforts to advance the vision of a free and open Indo-Pacific — a concept seen as designed to counter China’s rising clout and assertiveness in the region. “In order to establish the desired security environment for the Japan-U.S. alliance, it is essential to strengthen the presence of Japan and the United States in the Indo-Pacific region and we will continue our efforts to that end,” Iwaya said. Iwaya said he and Shanahan confirmed that Tokyo and Washington will push forward a plan to relocate U.S. Marine Corps Air Station Futenma within Okinawa Prefecture so as to achieve an early return to Japanese control of land in a crowded residential area of Ginowan. The central government maintains that relocating Futenma from Ginowan to the less-populated coastal district of Henoko in Nago is the “only solution” for removing the dangers posed by the air station without undermining the deterrence provided by the Japan-U.S. alliance. Despite fierce local opposition, reclamation work started last month for the construction of a replacement facility for Futenma. Iwaya, on a five-day visit to Washington and Hawaii that began Tuesday, had a separate meeting Wednesday with Trump’s national security adviser John Bolton.